The OS X text-editor market is burgeoning, especially with the advent of the Mac App Store and the capability to store documents on iCloud (and otherwise in the cloud). 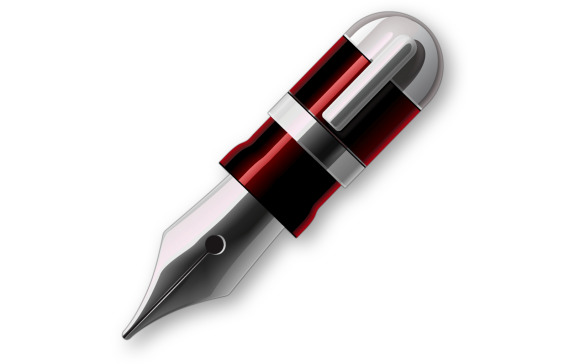 These writing apps range from minimalist text editors with few options to relatively powerful tools that approach the feature sets of word processors. 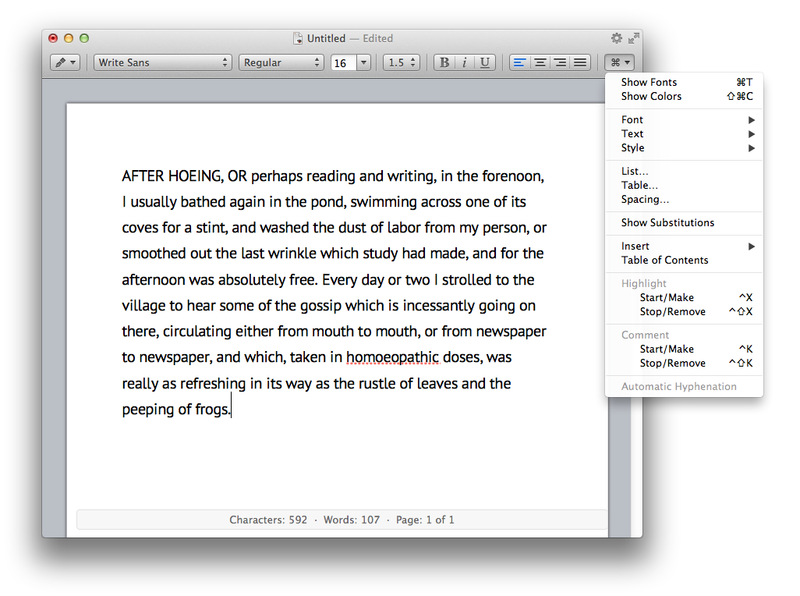 MOApps’ $7 Write 2 ( ; Mac App Store link) straddles the line between a simple text editor and a more-powerful word processor. It manages to not cross that line, stopping short of overwhelming you with too many features. 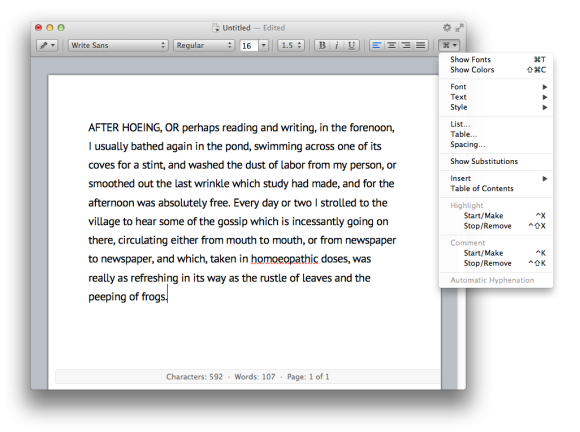 To start with, Write 2 has an uncluttered, alluring interface. A simple toolbar provides access to the most-important settings you’d want in a text tool: font, size, line spacing, character styles, and alignment. A Command button—it sports the actual ⌘ symbol—at the right edge of the toolbar displays a menu with many less-frequently used settings. A styles button at the left edge of the toolbar lets you choose and configure styles. Styles, common to text behemoths like Word and Pages, are one of the features that make Write 2 stand out from many other inexpensive text tools. Styles allow you to quickly apply a set of commonly-used character and paragraph settings—for example, a particular font, text size, alignment, and more. You can either click the styles button and choose a style, or you can choose Write 2 Styles (or press Control-Tab) to display a small window that shows what all your configured styles look like. If you’re used to styles in programs such as Microsoft Word, you’ll find a big difference here, however. With Word, if you click anywhere in a paragraph, then apply a paragraph style, that style will change the text of the entire paragraph. In Write 2, you must select the complete block of text—say, an entire paragraph—you want to change and then apply the style. Also, once you’ve applied a style, the Styles window closes; it would be useful to be able to keep that window open until you manually close it. Curiously absent from the Styles window are list styles, for either bulleted or numbered lists. You can create lists using the Format menu and then create your own styles, but bulleted and numbered lists are common enough that they should have their own styles or commands. Also, you can’t edit styles, so if you create a style and later want to modify it, you need to make a new style; this also means that to update any text that had the original style applied, you need to manually apply the new style to all that text. This is not the way styles should work. Write 2 comes with many advanced features. In addition to styles, it offers a full range of formatting options, such as lists, tables, tables of contents, comments, and a template chooser. (A number of preset templates are available, and you can create your own.) You also have extensive control over text display: You can zoom, display text in pages, use a ruler to set margins and tabs, and much more. Write 2 also supports full-screen mode, although Write 2’s full-screen view isn’t the best of the writing apps I’ve seen, as it merely extends the Write 2 window from the top to the bottom of your display, with a linen background on each side. One other display thing that irks me is the fact that the program has no “real plain text” mode—in other words, an uninterrupted flow of text. There’s always a very big white space between pages, even if you’re not viewing your document in layout mode (which shows actual pages with borders). Other nice features in Write 2 include typewriter scrolling (where the line you type remains in the center of the display all the time), headers and footers, support for right-to-left languages, and even vertical display. The app also offers iCloud support for document storage, and there’s OS X gesture support for zooming, toggling views or invisible characters, and showing and hiding word count or displaying the inspector. Write 2 can also open and save files in .doc, .docx, .rtf, .rtfd, .otd, and .txt formats. Some of the features that you’ll miss if you’re used to Word or Pages are endnotes and footnotes, change tracking, overly customizable toolbars, better support for image handling and text wrapping, and some of the other power-user features that make these programs complicated. Still, while there are plenty of things Write 2 can’t do when compared to, say, Microsoft Word, and I have some quibbles with a few of the app’s interface choices, most users will find Write 2 to meet all of their word-processing needs. It’s an impressive app, and at just $7, it’s almost a no-brainer for anyone who wants sophisticated features and the capability to make complex documents while maintaining an easy-to-use, minimalist interface.